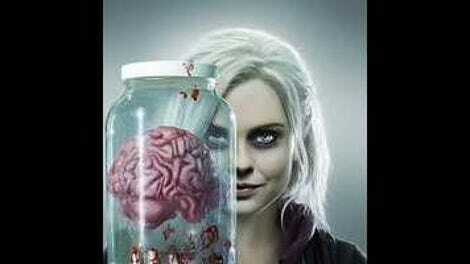 One of my biggest concerns about last week’s iZombie was how the device of Liv attaining the personality traits of the people whose brains she eats was potentially affecting us getting to know Liv as an actual character herself. “The Exterminator” quickly proves my worry premature, as the show smartly uses Liv’s confusing visit to Major’s apartment at the end of last week’s episode to have her go on her own little emotional scavenger hunt to determine how she can cope with becoming someone else every time she feeds. By trying to figure out how to reconcile these two very different parts of her new personality, Liv finally feels like a fully realized person and iZombie becomes emotionally richer as a result. Liv’s emotional tangle begins when she eats the brains of an exterminator who turns out to be a hitman with antisocial personality disorder (and a talent for choosing cheeky cover professions, apparently). She immediately starts feeling the numbing effects of his emotional detachment from the world, which has interesting side effects for Liv as she deals with the aftermath of her failed romantic overture to Major. Being numb is disconcerting in a general sense but has an upside for Liv, too: The less she feels, the less she misses Major, and the less it hurts when she finds out he might have moved on with someone else. This forces Liv to make a choice—eat more sociopath brains and feel nothing, or abstain and finally feel Major’s loss—and her choice to feel the pain is what takes her pain over losing her past relationship and makes it an integral part of her character, rather than the semi-forced thing it appeared to be in the first two episodes. Major as a character still feels like a bit of a square peg in a show full of round holes (albeit a handsome, funny, kind square peg) but his connection to Liv finally feels earned. Eating a hitman’s brains pays great emotional dividends in other areas as well, as Ravi and Liv investigate a supposed zombie sighting and find Liv’s party friend Marcy stuck in a hole and now transformed into a full zombie with no remaining human characteristics. The idea that people other than Liv were turned during that party is a great one—and I hope we get to meet more of them as the show develops—but what really resonates here is the sight of what Liv could have become, and what Liv now has to do to deal with her. Ravi hopes that some fresh brains will reverse Marcy’s symptoms and turn her back into a more Liv-esque zombie, but when that doesn’t work an emotionally deadened Liv must then kill her to prevent Marcy hurting someone else. The best part of this is how it is set up that she must kill Marcy in order to protect Ravi (who stupidly falls in the hole trying to take samples from Marcy) and in order to do that, she has to go into full-on zombie mode in front of him. This puts a lot of complex character beats into one quick action scene that could easily been a more throwaway moment. The most important reason for Liv to eat hitman brains, though, is so that the show can have its case of the week. This is the most layered case yet, with Liv’s visions offering clues to not one but two murders (the hitman’s murder, and the murder of the person the hitman killed right before dying), both of which have personal implications for Liv as well. In the process of obsessively trying to solve the murders, Liv throws a wrench in her roommate Peyton’s career at the district attorney’s office by blowing up her entire case, and Liv’s hitman brain can’t even let her feel bad enough about it to apologize sincerely. She also steamrolls Detective Babineaux into following a lead that could hurt his career, although Babineaux is so generally easygoing with Liv’s whims—even when those whims lead them to a bar that he correctly and amusingly describes as “Whitey Whitesville”—that this one is decidedly less of a prickly situation. Let’s talk about the murder investigation because, as generally inoffensive as it is, this is still the one aspect of the show that feels like it exist solely to give the show a framework to do all of the other, more interesting things. There’s nothing wrong with that—and the decently complex story of the tech genius who tried to sell his company to pay gambling debts and then ended up getting snuffed out by his greedy, arrogant partner isn’t bad, other than him falling for the too-obvious feint in the end—it’s just that of all the three cases we’ve seen so far, this one felt the most like it needed a bit more. The case does a great job of giving the show jumping off points for all of the different character moments it needs, and involving Liv’s roommate is a smart thing, but what was missed most in this one was the humor the other cases generally brought to the table. Between this and the hitman bringing out the extreme deadpan in Liv’s dead personality, this is the least playful episode, and that playfulness is missed. Even though the case renders out a bit of the humor, this is still the most emotionally complex episode so far, and that is mighty promising. 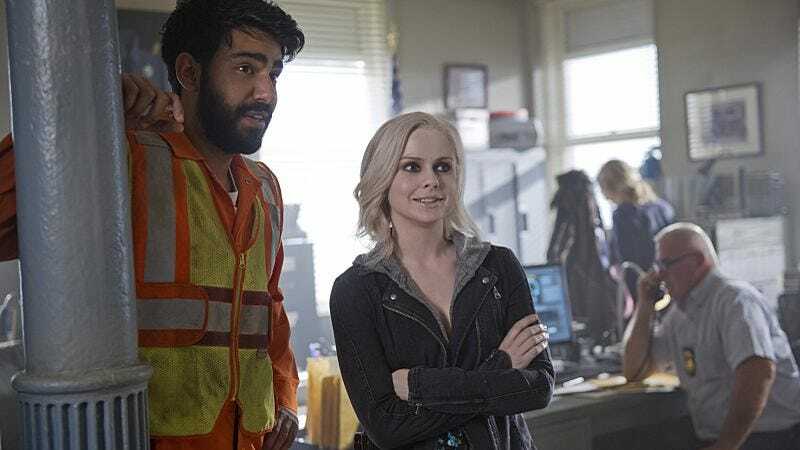 iZombie is still show feeling out what exactly it wants to be over the long term, and the promise of the blending of playful humor, emotional complexity, and whatever is going on with Blaine and his more sinister zombie aims over the course of the season remains enticing. Any way you look at it, that the show is this solidly entertaining so early on is an impressive thing. Liv’s relationship with Blaine went straight to antagonistic and quickly in this episode, and I think this is a good thing. This show needs a layer of malevolence and giving this to someone as charming and fun as Blaine makes it far more interesting. Now, is he creating a zombie commune, a cult, an army, or what? Or is he just using those poor kids as a buffet? Why the hell did Peyton show Liv that video of Major kissing a new woman? Get it together, Peyton. Can Liv draw the car so well because she still has latent art talent from the artist brain? Liv wearing (maybe) Ravi’s OMg! elements shirt is my favorite little throwaway thing. The latent Brian Krakow-lover in me adores that Devon Gummersall is “eye candy” now. You go, Krakow. “You didn’t say you was marrying Siri.” Jerome is an immediate favorite and I don’t want Blaine to zombify him. Or eat him. Or harm him, in general. Come back, Jerome!